Are you tired of all your LPs (or those owned by your parents, back in the day) sitting on the shelf, with no way to listen to them? Vintage turntables can be quite expensive, and there’s no guarantee that old turntables will give you many hours of listening pleasure. The Audio-Technica LP 60 USB is designed to play your LPs with the sound you’re accustomed to, as well as giving you a way to transfer them to digital audio. Most turntables in this price range use a ceramic cartridge. This model has a magnetic cartridge. This provides you with better, clearer audio. This type of cartridge may be more sensitive to vibration, but it skips less and performs better than ceramic cartridges. The AT-LP 60 USB is belt-driven. This means the motor is not attached directly to the platter. A belt helps it to rotate. Some people think that direct drive turntables are better, but this is simply not true. Direct drive may be more useful to DJs, since the torque is higher. However, for daily listening, more turntables are belt driven. The belt is helpful in attenuating the noise that comes from the motor to the stylus. This unit does not have built in speakers. But it’s an easy fix. Just hook up a pair of external self-powered speakers to listen to your favorite vinyl. You can also hook this turntable to a guitar amp, with proper cable adapters. Operation is completely automatic, which keeps your vinyl records from getting scratched. No external drivers are needed to connect the turntable directly to your PC or Mac computer. Turntable plays both 33 & 1/3 and 45 RPM records. Switchable, built-in pre-amplifier allows you to use the turntable with any stereo system that has phono or magnetic inputs. Since 1962, Audio-Technica worldwide has been dedicated to designing, building and marketing audio equipment, including turntables. They were first known for phonograph cartridges that were state of the art. They still create these, and now they also design and engineer wireless systems, headphones, microphones and sound mixers. Audio-Technica has won a number of industry awards, and their turntables are known for durability, quality and excellent performance for the price. Their equipment has been used for recording studios, broadcasting and live sound tours. The products of Audio-Technica have provided superior performance in audio coverage at US presidential debates, Olympic Games, the Super Bowl and World Cup Soccer matches. Their products are marketed throughout the Eastern and Western Hemispheres. They are a leader in their field, on a global scale, providing exceptional value and superior performance for world-wide customers. High quality turntables can be very expensive, but this model is one of the exceptions. It offers good sound quality without a big price tag. Having used many new turntables, I can honestly say that the Audio Technica AT-LP 60 is one of the best turntables in this lower price range, and I recommend it. This turntable is really tough to beat in this price point, and unless you are a professional DJ, it should fit your listening needs quite well. Any record player can transfer music to digital format, but the software and connections provided on this AT turntable make it utterly easy. You can digitize your LPs without any hassle at all. If you have a budget and you’re new to LPs, or haven’t listened to them for awhile, the AT LP-60 may well exceed your initial expectations, especially when you look at the price. If you are looking for an automatic turntable that is very easy to use, this model is one you should consider. It will give you great listening experiences without costing a lot. In my research before purchasing this model, one of the record players I compared it to was the Crosley CR8005A-PI Cruiser Portable Turntable. The price point is fairly close, but the Audio-Technica offers more for the money than the Crosley model. The Crosley doesn’t have pitch control or a USB connection for music reproduction, and the Audio-Technica model does. Now you can listen to and reproduce the great sounds from those old LPs that have just been left sitting around since old record players were replaced by digital music formats. 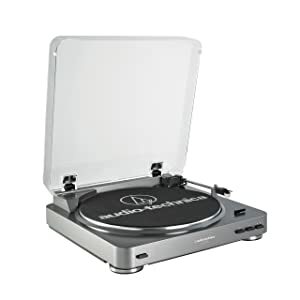 With the Audio Technica AT-LP 60 USB, you can not only listen to your old vinyl, but you can convert your LPs to digital music format so you can take your old favorites with you. Check out this great deal on the Auto Technica AT-LP60USB.